Ghosn, shown, has lost key executives but Nissan says the departures reflect the normal dynamics of a competitive market. TOKYO (Bloomberg) -- Nissan Motor Co.'s loss of its second executive since July is fueling concern that the pool of talent surrounding CEO Carlos Ghosn is drying up. Nissan Chief Planning Officer Andy Palmer is leaving the company to lead Aston Martin. Palmer's departure come almost eight weeks after the president of Nissan's premium Infiniti brand, Johan de Nysschen, jumped to Cadillac. 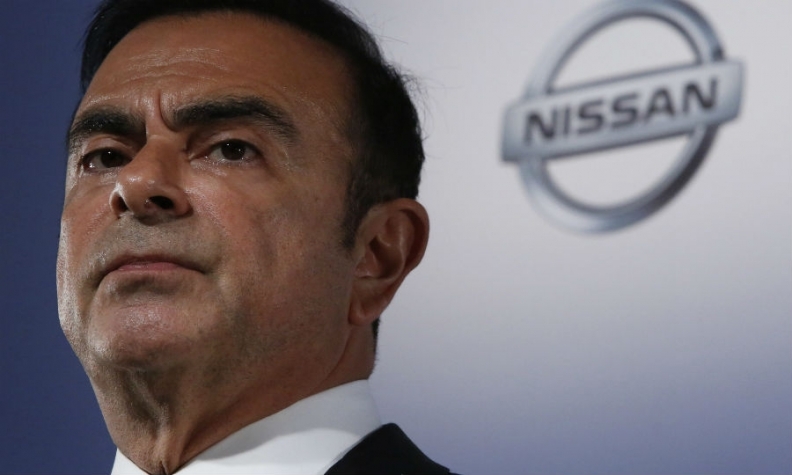 Ghosn, who is also CEO at Renault, lost his chief operating officer Carlos Tavares at the French carmaker in 2013 and his communications head Simon Sproule earlier this year. The defections add to the challenges facing Ghosn, 60, a man so lauded for saving Nissan from near bankruptcy in 1999 that he drew offers to run larger automakers and starred in a comic book. Today, Japan's second-largest automaker is lagging behind key financial targets and the Leaf electric vehicle he's championed since 2009 is contending with Tesla Motors' popular Model S.
"A number of very capable guys are leaving Nissan," said Koji Endo, a Tokyo-based auto analyst at Advanced Research Japan. "The situation doesn't really seem to be encouraging." Nissan said the departures reflect the normal dynamics of a competitive market. "In this industry, there's a lot of movement and will always be a lot of movement," said Jeff Kuhlman, who prior to becoming head spokesman at Nissan worked for Audi and General Motors Co.
Kuhlman said Nissan has been successful in attracting talent, such as Gaby-Luise Wuest, who was hired in July from BMW to be vice president for global operations at Infiniti. Palmer, who joined Nissan 23 years ago, will become CEO of Gaydon, England-based Aston Martin -- the century-old maker of luxury sports cars featured in James Bond movies -- after a transition period. In making the move, the 51-year-old British national will be going to a company that sold 4,200 vehicles last year from one that delivered more than 5 million. Palmer's job at Nissan will be filled by Philippe Klein, an executive vice president at Renault, starting Sept. 15. After joining Nissan's European technical center in 1991, Palmer moved to the light-commercial vehicle business before taking on broader duties including project management, marketing and emerging markets. In a management overhaul in November, he was promoted to chief planning officer -- one among a handful of executives reporting directly to Ghosn. After the changes, Palmer said one of his biggest focuses would be to rein in marketing costs in the U.S. as profits were falling short of the company's projections. This year, Nissan's incentives rose 0.6 percent to $2,570 a vehicle, while the industry rose an average 5.5 percent, according to market researcher Autodata. "There's a core management team at Nissan and Andy Palmer was a very crucial part of it," said Ashvin Chotai, managing director of researcher Intelligence Automotive Asia. "He had a lot of responsibilities and a lot of functions under his umbrella. To lose somebody like him is a big blow to Nissan." Palmer's replacement will face the challenge of helping Ghosn lift Nissan's operating-profit margin to 8 percent of sales and increase global market share likewise to 8 percent by March 2017. Nissan's market share stood at 6.2 percent as of the end of March, and the operating margin was 5.3 percent. Nissan also targets its Infiniti unit to capture 10 percent of the world's premium-car market by the end of the decade. Infiniti's sales last year were about a tenth of BMW's. The departure came as Nissan was seeking to fill the void created when Infiniti chief de Nysschen, who reported to Palmer, left for GM's Cadillac brand. Palmer then took on an interim caretaker role for Infiniti, a responsibility that will be handed off to Jose Munoz, Nissan's executive vice president in charge of North America. Sproule, Ghosn's communications chief, went to take on the same role at Tesla earlier this year, and Tavares, Ghosn's right-hand man at Renault, quit in August 2013 to become CEO of Paris-based rival PSA/Peugeot-Citroen.